‘The Case for Miracles’ is a fascinating book. I have read many books on miracles, but this one is different. What is the difference? In the process, he interviewed leading Biblical scholars, and the opposite happened, as this atheist becomes a Christian. His story is told in the book ‘The Case for Christ,’ which recently became a major motion picture. It is not a book of testimonies of miracles although you will find plenty of them in the book. We will include one at the end of this letter, which is quite incredible. It is not primarily a study of the miracles of the Bible. It deals with miracles – do they happen today? It is not a book that intends to build one’s faith to believe for miracles, although that will inevitably happen. It is the work of an evangelical pastor who was trained and worked as a journalist searching out the subject of miracles happening today. He uses the same methods and procedures that he used as an award-winning journalist to check out the evidence for claiming that miracles happen today and can they be proved. Is there empirical evidence enough to satisfy people that miracles are real. As I said, this different approach produces a fascinating book. The book is broken up into sections built around interviews with leading scholars. 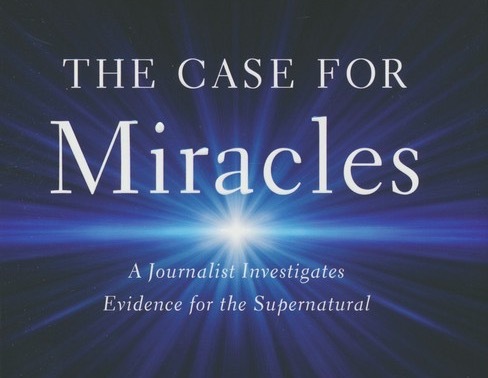 Strobel starts off with “the case against miracles” as he interviews leading American atheist Dr. Michael Shiner and hears the arguments that atheists make concerning God and miracles. Other sections deal with ‘Science, Dreams and Visions,’ the most spectacular miracles of creation and the universe and planet, a fascinating section, and the miracle of the resurrection.’ Finally, he doesn’t avoid the ‘difficulties with miracles,’ with a chapter on ‘Embarrassed by the Supernatural’ and ‘When Miracles Don’t Happen,’ where Strobel deals with his own challenges concerning his wife Leslie, who lives every day of her life with pain suffering from fibromyalgia. What was the end result of the book? Let Strobel give you his own answer, “After nearly two years of research, I came to my own verdict about miracles: they’re often credible and convincing, and they contribute powerfully to the cumulative case for Christ. Compelled by the facts, I joined Leslie in following Jesus – and the word miracle isn’t far off in describing the way God has revolutionized my life a result. Dr. Craig Keener (The author of a two-volume book on miracles), went on to discuss another case, for which there’s significant documentation. “I’ve personally interviewed Barbara, who was diagnosed at the Mayo Clinic with progressive multiple sclerosis,” Keener said. “I’ve confirmed the facts with two physicians who treated her. There are numerous independent witnesses to her condition and years of medical records. In fact, two of her doctors were so astounded by her case that they’ve written about it in books. Another physician, Dr. Thomas Marshall, an internist for thirty years until his recent retirement, described Barbara as a budding gymnast in high school, playing the flute in the orchestra. But symptoms began appearing: she would trip, bump into walls, and was unable to grasp the rings in gym class. Eventually, after her condition worsened, the diagnosis of progressive multiple sclerosis was confirmed through spinal taps and other diagnostic tests. After thoroughly examining her case, doctors at the Mayo Clinic agreed with the dire diagnosis. “The prognosis was not good,” Marshall said. Over the next sixteen years, her condition continued to deteriorate. She spent months in hospitals, often for pneumonia after being unable to breathe. One diaphragm was paralyzed, rendering a lung nonfunctional; the other lung operated at less than 50 percent. A tracheostomy tube was inserted into her neck, with oxygen pumped from canisters in her garage. She lost control of her urination and bowels; a catheter was inserted into her bladder, and an ileostomy was performed, with a bag attached for her bodily waste. She went legally blind, unable to read and only capable of seeing objects as gray shadows. A feeding tube was inserted into her stomach. “Her abdomen was swollen grotesquely because the muscles of her intestine did not work,” Adolph said. By 1981, she hadn’t been able to walk for seven years. She was confined to bed, her body twisted like a pretzel into a fetal position. Her hands were permanently flexed to the point that her fingers nearly touched her wrists. Her feet were locked in a downward position. Marshall explained to her family that it was just a matter of time before she would die. They agreed not to do any heroics including CPR or further hospitalization, to keep her alive; this would only prolong the inevitable. Barbara entered hospice care in her home, with a life expectancy of less than six months. One day someone called in Barbara’s story to the radio station of the Moody Bible Institute in Chicago. A request was broadcast for listeners to pray fervently for her. Some 450 Christians wrote letters to her church saying they were lifting Barabara up in prayer. On Pentecost Sunday, 1981, her aunt came over to read her some of the letters in which people offered prayers for her healing. Two girlfriends joined them. Suddenly, during a lull in the conversation, Barbara heard a man’s voice speak from behind her – even though there was nobody else in the room. “The words were clear and articulate and spoken with great authority, but also with great compassion,” Marshall wrote. Her mother ran into the room and dropped to her knees, feeling Barbara’s calves. “You have muscles again!” she exclaimed. Her father came in, hugged her, “and whisked her off for a waltz around the family room,” Marshall said. Everyone moved to the living room to offer a tearful prayer of thanksgiving – although Barbara found it hard to sit still. That evening, there was a worship service at Wheaton Wesleyan Church, where Barbara’s family attended. Most of the congregation knew about Barbara’s grave condition. During the service, when the pastor asked if anyone had any announcements, Barbara stepped into the center aisle and casually strolled toward the front, her heart pounding. A chest x-ray that afternoon showed her lungs were already “perfectly normal,” with the collapsed lung completely expanded. “The intestine that had been vented to the abdominal wall was reconnected normally,” Adolph said. “She was eventually restored to complete health. Barbara had now lived for thirty-five years with no recurrence of her illness. “She subsequently married a minister and feels her calling in life is to serve others,” Marshall said. Both physicians marvel at her extraordinary recovery. “I have never witnessed anything like this before or since and considered it a rare privilege to observe the hand of God performing a true miracle,” Marshall wrote.